I love to write stories in fantasy settings. Sometimes those settings are within our world (urban fantasy) and sometimes they are in a world which is completely of my own construct. However, even as I typed that last sentence I was shaking my head. I believe that the most successful fantasy worlds employ the use of real places that are just fantastical. My husband and I are coming up on our 13th wedding anniversary. Lucky 13! We both share a love of traveling and hope that someday soon we can do more traveling along with our son. One trip we plan to take is to the Ice Hotel in Sweden to renew our wedding vows. The photographs of the place are utterly amazing. You might even recognize it from the James Bond movie Die Another Day. I suppose my point is that fantasy doesn’t need to be that hard. It doesn’t need to be completely out of this realm, in fact I think if we can pick places in this world that are fantastical and out of the ordinary and put them into our fantasy they will be both relatable and an escape into something spectacular. Have a great weekend everybody! Cheers! 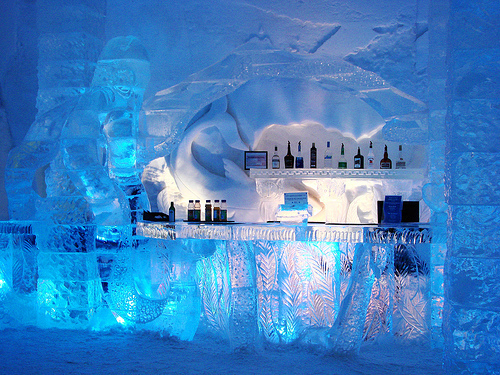 This entry was posted in On Writing and tagged fantasy, ice hotel, writing tips. Bookmark the permalink. Happy 13th anniversary. The ice hotel sounds amazing. Thanks! It really does look amazing. When you land you get taken there by dog sled and you can spend a night inside a room of ice sleeping on deer pelts. Wow. That’s going on my bucket list. Love to travel too! Hubby used to work for an airline company and so we got a lot of free tickets in our younger days. Not anymore. 😦 We may try our first international family trip next year.